Comedian, actor, and jazz singer Ana Gasteyer gets real about what she’d do differently if she could relive her time on ‘Saturday Night Live,’ why Kathy Griffin might be to thank for her time on the show, and the unexpected upside of getting older. 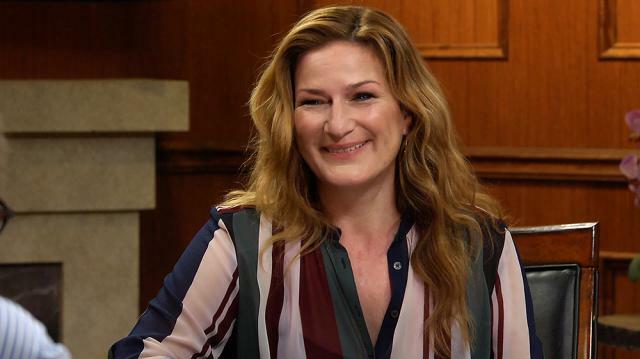 Comedian, singer, and actress Ana Gasteyer joins Larry King before the premiere of her new TBS sitcom “People of Earth.” The show, centered around a support group of alien abduction survivors, features Gasteyer as the group’s therapist. She reflects on the type of grounded comedy the show brings to the table, as well as her long-standing relationship with Executive Producer Conan O’Brien. Later, the “Saturday Night Live” alum and Larry revisit her wealth of roles on the iconic series. Ana Gasteyer has taken the stage in the guise of such legends as Hillary Clinton and Martha Stewart. She speaks warmly of both women, especially of Clinton’s capabilities as a politician. Then, the two turn to the show’s iconic place in American television, and the revolutionary impact the show has had on politics. Finally, Larry King invites Ana Gasteyer to open up about her time as a jazz singer and Broadway performer. From her album “I’m Hip” to her tenure as Elphaba in the smash hit “Wicked,” Gasteyer has a longstanding career as a true variety performer. Now, with a leading role on the Netflix Original series “Lady Dynamite,” Ana Gasteyer shows no signs of slowing down.